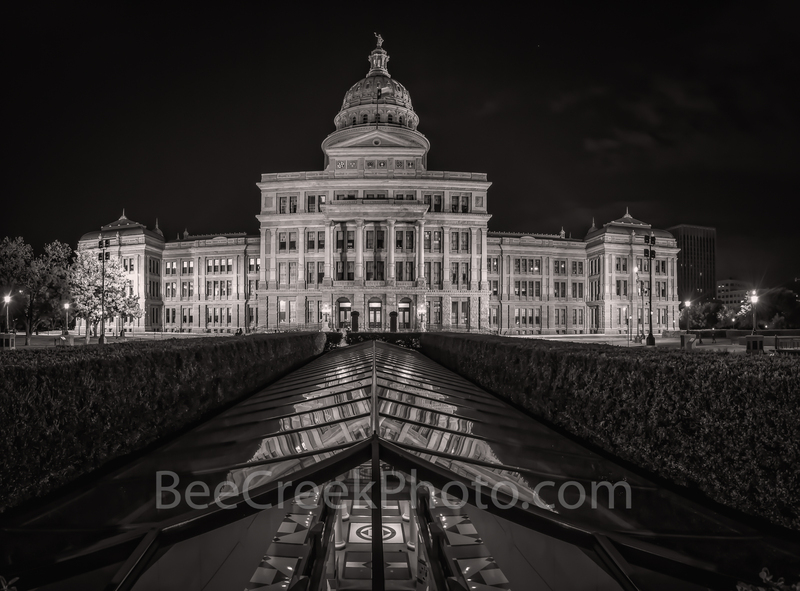 Texas Capitol View at Night Pano BW - The Texas Capitol view in black and white in a vertical panorama from the skylite extension at night that run underground to the outside rotundra. The Texas State Capitol is a historical landmark and one of the most visited site in the city. This was area was updated and an extension was added underneath the capitol in the mid 1990's. The Texas capitol is an impressive site with its red granite and oak hill limestone along with the skylite in view. The Texas State Capitol is the capitol building where the government for the state resides. Located in the heart of downtown Austin all of the offices and chambers of the Texas legislature is housed here. Built in constructed 1882 to 1888. An extension was completed in 1993 at a cost of $75 million underground extension. The capitol sits on 22 acreas of land in the heart of downtown Austin on Congress ave. building was added to the National Register of Historic Places in 1970 and a National Historic Landmark. The Texas State Capitol is 302.64 feet tall is the sixth tallest state capitol in the US. Photo © copyright by Bee Creek Photography - Tod Grubbs / Cynthia Hestand.